The village of El Kab is situated about 80 km south of Luxor and 15 km north of Edfu on the east bank of the Nile. It’s easily to visit in one day from Luxor and if you want you can combine it with a visit to the Temple of Khnum in Esna or the Temple of Horus in Edfu. El Kab is the present name of the ancient site of Nekheb, one of the oldest settlements of Upper Egypt. The goddess Nekhbet was represented by a white vulture. These birds of prey, whose habitat is restricted to the desert, were easily differentiated from the eagle by the white underside of their wings. Nekhbet is equated to the white crown of Upper Egypt. The actual city of Nekheb had the shape of a massive square with a huge surrounding wall of mud bricks, 12 m thick, at the water level. This wall was probably erected by Nectanebo 2 of the 30th Dynasty (towards 360 – 343 BCE). The massive mud brick wall is still largely preserved. The heart of the city consisted of two massive temples. The main temple, erected in sandstone, was dedicated to the goddess Nekhbet. The second temple was dedicated to Sobek and to Thoth. To the east of the surrounding wall we find two small temples: one dating from Thutmose 1, the other one from Nectanebo. There is evidence that the site was occupied since prehistory with signs of a Palaeolithic industry dating from about 7000 BCE. An important cemetery is dating from the time of Naqada 3 (towards 3000 BCE). Numerous prehistoric graffiti also exist on the walls of the wadis. Well worth seeing are also numerous pre-dynastic petroglyphs and Old Kingdom inscriptions which you can find on your way between the temples on the faces of the rocks. 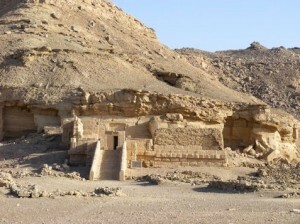 At the entry of the Wadi Hilal one finds also the repository chapel of Amenhotep 3 (a monument half dug into the cliff, half external structure) and a chapel from the days of Ramses 2. The necropolis of El Kab dates back to the New Kingdom (18th – 20th Dynasty). It shelters several rock cut tombs, ranged on a terrace in the side of the cliff, at the entrance at the Wadi Hilal. The hill-side rock tombs with its colourful reliefs, includes scenes of the daily life, as well as religious depictions in the context of the tomb owner’s burial. Tomb no. 3 is the Tomb of Paheri. He was mayor, priest of the goddess Nekhbet, and tutor during the reigns of Thutmose 3. The well-preserved paintings in his tomb show scenes of offerings at his funeral procession, agricultural scenes and daily life scenes of fowling and fishing and the preparation of food. Tomb no. 4 is the Tomb of Setau, a high priest in the service of the goddess Nekhbet during the reign of Ramses 3. The paintings inside show the tomb-owner with his relatives in various offering scenes. Tomb no. 5 is the Tomb of Ahmose. He was the grandfather of Paheri and son of Ibana. He served in the military under Thutmose 3. The paintings in his tomb tell us about his wedding, his participation on wars of liberation against the Hyksos rulers and about battles against the Nubians. Tomb no. 7 is the Tomb of Renni, who was mayor, provincial governor and high priest during the reign of Amenhotep 1. His tomb depicts the usual agriculture scenes, banquet scenes and funeral procession. The ceiling f the tomb is beautifully painted to represent the cloth roof of a tent or canopy.